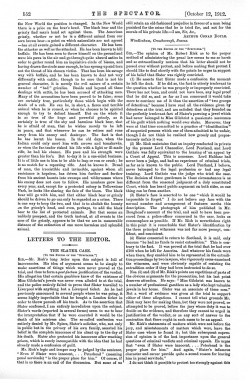 The Slater Case is a letter written by Arthur Conan Doyle first published in The Spectator No. 4398 on 12 october 1912. Sir, — Mr. Risk's long letter upon this subject is full of inaccuracies. His idea of argument seems to be simply to make assertions of things which were never proved at the trial, and thus to form a post-factum justification of the verdict. His allegation that certain gamblers knew of the existence of Miss Gilchrist's jewels was never even alluded to at the trial, and the police entirely failed to prove that Slater travelled to Liverpool with anything but a Liverpool ticket. As he had previously announced to several people where he was going, it seems highly improbable that he bought a London ticket in order to throw pursuit off his track. As to the assertion that Slater confessed, I am entirely incredulous upon the subject. Slater's words (reported in several forms) seem to me to bear the interpretation that if he were executed it would be the death of his mistress also. The so-called confession was entirely denied by Mr. Spiers, Slater's solicitor, who, not only in public but in the privacy of his own family, asserted his belief in the complete innocence of his client up to the day of his death. Slater also protested his innocence after reaching prison, which is surely incompatible with the idea that he had already made a confession of guilt. This page was last edited on 15 July 2016, at 14:12.